​Hedgehogs are solitary animals by nature. Some are huffy and may make clicking noises. It is completely normal. Once they feel safe they will put down their quills and start nosing around. Others love to be handled and don't exhibit this behavior. They all have their own unique personalities. In order for them to be more social, they should be handled on a daily basis for at least 30 minutes. This helps them to socialize and feel comfortable in their surroundings. Some may take longer than other to get used to handling. Like all animals, washing your hands before and after handling is a good practice. It prevents the spread of E.coli and salmonella. Always use non scented soap. Pine and Aspen wood shavings are recommended if you decide to use wood shavings. Just make sure they have been kiln dried to removed any harmful chemicals. NEVER USE CEDAR as the oils in the wood are toxic and are harmful to your hedgehog's respiratory system. Fleece is also a safe alternative to wood shavings. Paper bedding, such as Carefresh, is safe to use, as well as fleece to line bottom of cage. Hedgehogs are very active at night and need plenty of room. Their cage needs to be a minimum of 4 square feet. NO multi-tiered cages! Hedgehogs have poor balance and eye sight and may fall off stairs and elevated platforms. Their cages require a solid flat bottom. Small animal cages or 105 qt Sterilite plastic totes are acceptable. Cages need to be spot cleaned daily and fully cleaned at least once a week with warm water and soap. No harsh toxic chemicals. Hedgehogs are nocturnal animals so be sure they are kept out of direct sunlight. Their area needs to be kept between 72-78 degrees F.
Hedgehogs can be very active at night. They will need a proper exercise wheel to maintain a healthy weight. A 12 inch wheel with a solid running surface is your best option. NO WIRE WHEELS with openings on the running surface where they can potentially get their feet caught and injure themselves. Hedgehogs love confined spaces and something to burrow themselves in. PVC tunnels and other small animal toys are acceptable, as long as they can't get themselves, feet or tongue caught. A high protein, low fat dried kibble is ideal for hedgehogs with the addition of insects to be used as treats. Many people use a high quality cat or kitten food, or a commercial hedgehog food, like Spike's Delight. Your veterinarian may have suggestions for you too. Only feed 1-2 tablespoons per day. A healthy weight for an adult hedgehog can vary between 300-400 grams. Whichever commercial food you choose should be supplemented by a variety of other foods, such as vegetables, mealworms, crickets, cooked meats, and fruit. However, none of these should be fed as anything more than a treat 3 or 4 times per week. The dry food should be the staple. 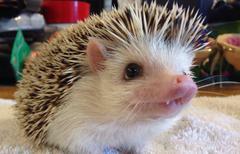 Be sure to complete a Hedgehog Adoption Application if you are interested in adopting from us!